Well I am still plugging along with my bedroom makeover and today I was lucky enough to be hit with more inspiration. 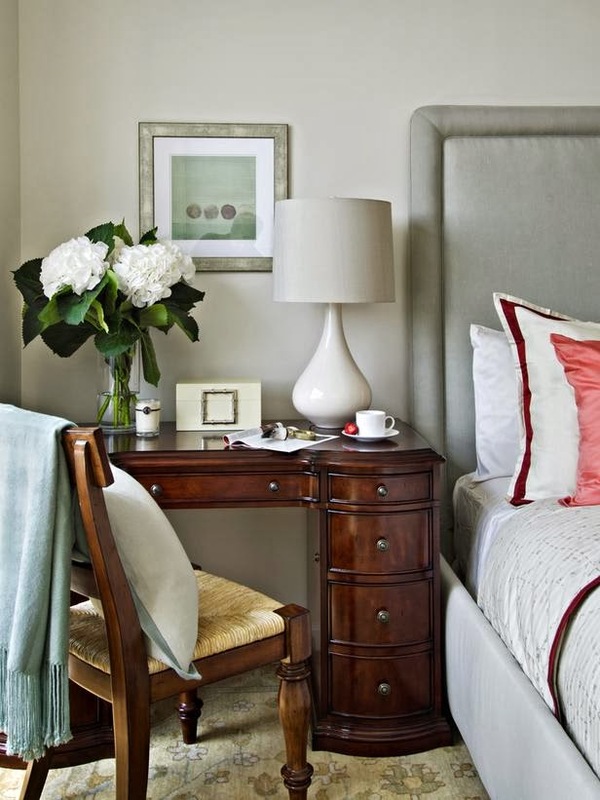 Originally my plan was to use a roadside find nightstand for Mr. Rosemary Lane's side of the bed, and as I was doing a little image searching for vignette ideas I came across this stunning picture from HGTV of a desk doubling as a nightstand. I suddenly remembered that I have this desk/dressing table in our garage. I picked it up at a yard sale for only $15 two years ago and since then Mr. Rosemary Lane has been using the drawers for tool storage. 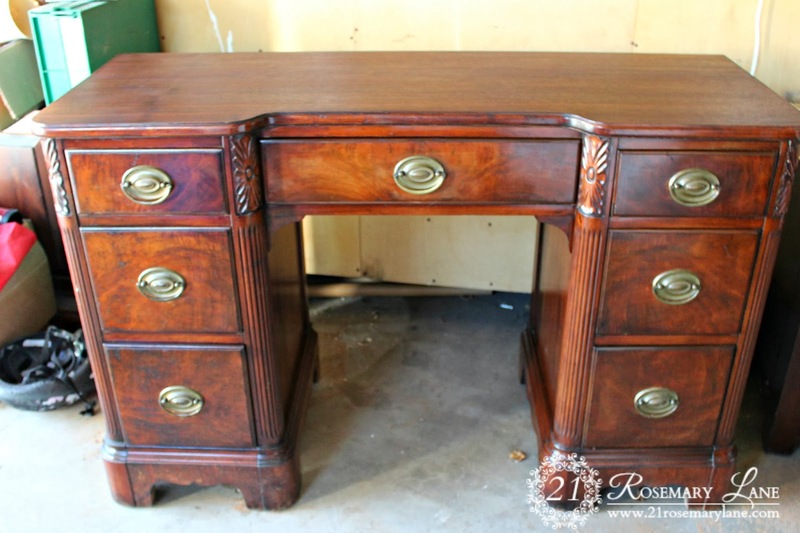 According to the man I purchased it from this desk or dressing table is probably somewhere in the neighborhood of 60 years old. My initial thought was to paint the piece, but then after seeing that gorgeous desk from HGTV I decided to use it as is. The top was a bit mucked up with water stains and scratches but the rest of the piece was in pretty decent shape. So this morning I sanded down the top and then re-stained it with a little Minwax! I wiped the rest of the piece down with some Old English. Then during MR. RL's lunch break this afternoon, he is now working from home two days a week, we carried the big lug of a thing from the garage up to the bedroom. A perfect fit if I do say so myself!!! Now I just need to track down an interesting chair to compliment the piece and I will have a cozy spot to work in addition to some great extra storage! I am really enjoying the warm weather we are having today. It felt so good to get outside and do a little furniture project after being cooped up with all of the frigid temps we had last month. I know it is going to get cold again, but at least for just one day we are reminded that spring is on its way! It sure cleaned up good! Looks great. Another idea I saw recently was to use a 2-sided file cabinet painted a pretty perky color. I love it, wish mine was in that condition. I love that it's being used as a nightstand too! Love it! I have an all wood one but I don't think it's in that great of condition like yours. I'll have to try some Old English on it first before I paint. Love those tulips too! Oh Barb, the desk is perfect and looks so good. You really did a great job of putting finishing touches on it. Congratulations hope that Mr. Rosemary Lane loves it. Have a great week and hopefully the weather is going to be much better. What a beautiful piece Barbara...it's perfect for that spot!! It is gorgeous and really is perfect for that space!!!!!!!! What a nice piece, Barbara! It's perfect as a side table! 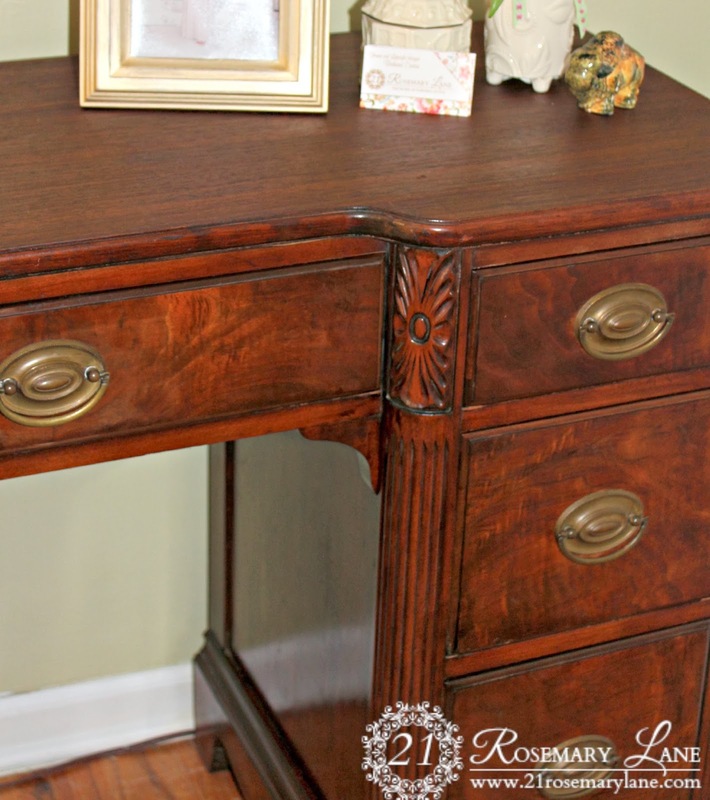 I used a sofa table as a side table in our guest room; and it works perfectly as a desk or dressing table. You did a great job cleaning it up! What a great idea, & it looks fantastic. Barbara, please mention what your wall color is....LOVE THAT SHADE OF GREEN. Hi Cynthia...the color is by C2 Paints and it is called New Leaf. It really is a beautiful color...I like during the day and in the evening with just the room lamps on. It was a bit pricey as paints go but I pretty much only needed one coat of paint. 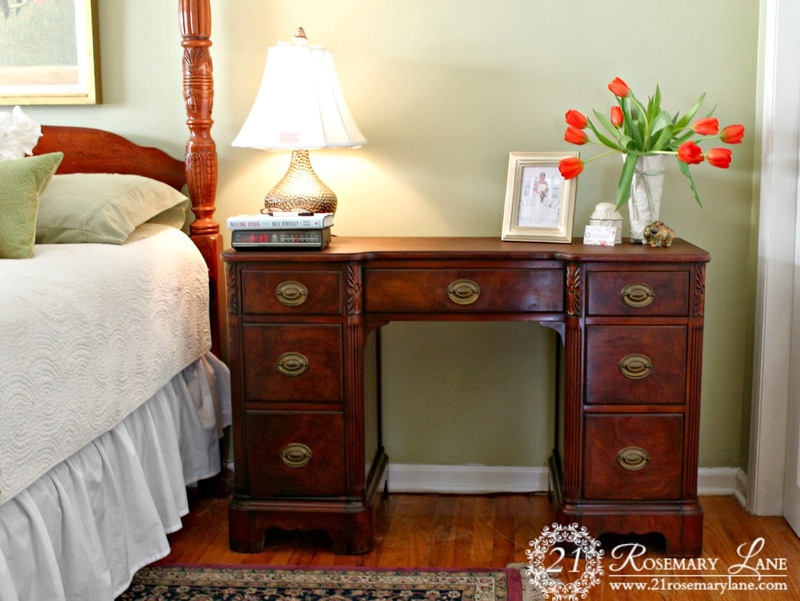 The desk as a night table adds so much interest and style to the room that you couldn't have gotten with the usual piece. It looks great. I'm impressed.